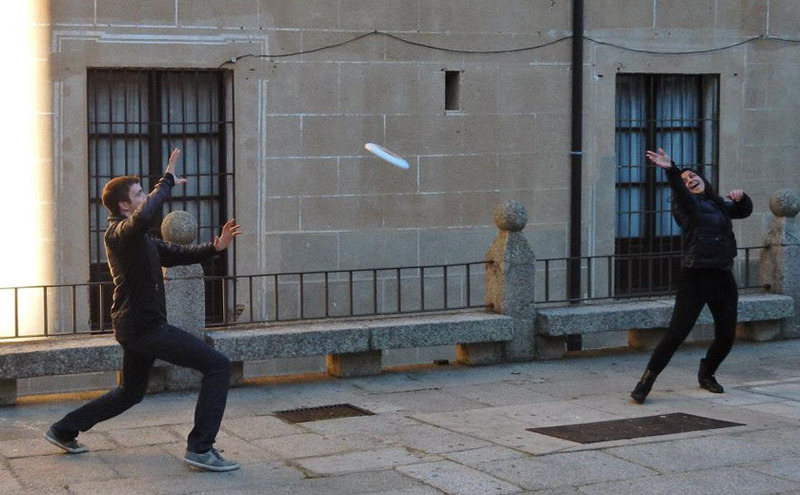 Shurouq Hijaze plays Frisbee with fellow ECE student Seth Schober ’16 in Caceres, Spain. Students often say the best thing about studying abroad is being out of your comfort zone – and learning to cope in spite of that. An example of that occurred when Shurouq Hijazi ’16 studied abroad in Madrid during the Spring of 2015. The electrical and computer engineering major arrived knowing only a couple of words of the language. Her first exam was in English, but the sheet she was given to write her answers on was in Spanish. At least the word next to one of the blanks seemed obvious enough. “Asignatura.” She filled in her signature – and drew a hearty laugh from her professor. “Asignatura” means subject or class! In addition to a Spanish language course, Shurouq was able to complete three high-level ECE classes that she would normally have taken here. Once the approvals for those courses were in place, the application process was “a piece of cake,” she said. Her financial aid package was adjusted to help meet her costs, and she also received two relatively small but helpful grants from the IES study abroad program. Shurouq Hijazi at Buen Retiro Park in Madrid.